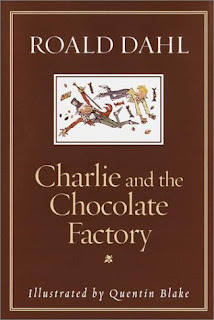 Description: When Charlie Bucket finds himself the proud winner of a Golden Ticket in a chocolate bar, he knows he has the greatest treat in the world in store for him. Join Charlie on his fantastic world-famous adventures in Willy Wonka's miraculous chocolate factory, where he sees strawberry-juice water pistols, luminous lollipops, a chocolate river, and rainbow drops -- and has the time of his life. Mini Review: I wanted to like this one more, but to be honest, I just didn't love it. I have seen the original movie with Gene Wilder (Who I adore) as well and didn't like that particularly either. I feel sort of bad saying I really didn't like either the book or the movie, since so many people love both, but honestly it just freaks me out. I do really like and appreciate the moral of the book, but I am sorry the story itself it is just plain odd and it creeps me out. I found it overly cruel, strange and I have to say I was a tad irritated by the over moralizing of kids who watch too much TV or chew gum -- but than again it was written a long time ago. I think I will give it to Jake to read, it will be interesting to hear what he thinks of it. It's funny that kids see things differently because I remember loving it as a child but I think I would feel like you now that I am a mom. This os one I;ve always meant to read and haven't.